These headlines are nothing new. Since at least the time of the Jetsons’ Rosey the Robot (which first aired more than 50 years ago), we have been wondering and worrying about what will happen when machines can do the work that people do. 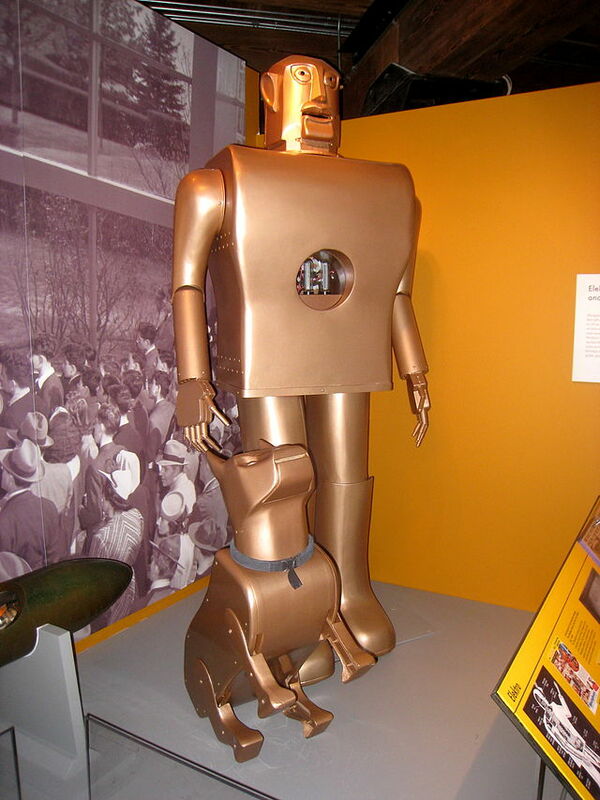 The robot man and dog pictured here were constructed for the 1939 World’s Fair. And in some ways, that future is already here. Just recently, a new “humanoid” was unveiled in a Toyko department store. The amazingly lifelike robot, named Aiko, is working in customer service at the store and is often mistaken for a human being. And sometimes, robots are performing human jobs completely without our knowledge. Last year, the Associated Press began using an automated computer system to do some of its reporting, such as coverage of businesses’ quarterly earnings reports. The AP’s robot journalists now “write” about 3,000 of these stories each quarter. All this talk of whether robots will take (or are already taking) our jobs made me especially interested in a story about the opposite phenomenon – humans taking a computer’s job. If I search for a “red shirt” on Amazon, I’d always assumed that the search was being done completely by computer algorithm, with no human involvement. But I was wrong. In fact, that kind of search is incredibly hard for a computer to figure out, because there are so many different ways of describing the color red (crimson? pink? scarlet?). Figuring this out requires human judgment. And, Amazon discovered that this wasn’t the only thing computer software couldn’t do well – Amazon had millions of tiny jobs that required a little bit of human input. So Amazon started advertising these tiny jobs for people to do online, and other companies followed. Today, there’s an army of people, referred to as “Mechanical Turk” workers, who do these mini-jobs for thousands of businesses all over the world. Each task usually takes a few seconds or a few minutes, and pays a few pennies or dollars. The Mechanical Turkers usually do this work on the side – it can’t pay the bills – but it’s interesting and varied work. All this made me want to start doing some Mechanical Turk tasks. For once, I’d like the computer to be worried about whether its job is secure.